The foremost military woman in Medieval History left no contemporary likeness. Her burning at the stake in 1431 as a heretic in Rouen, France was a ghastly affair. Now, for the first time, you can "see" the market square Joan saw as she was taken to the stake. Find out how and why it happened and own a copy of her only portrait. An excellent woman's story. 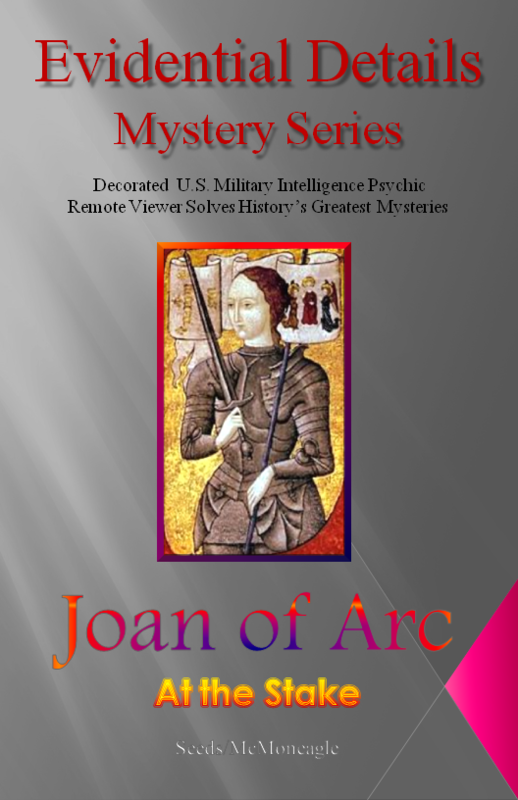 ​​"I found the Joan of Arc book fascinating. The added information provided by Joe (McMoneagle) was just terrific, and consistent with the rest of what I have seen via your books. In Joan, as in Otzi, there is a wealth of new information..."
"One of the highlights of these books is the attention to detail, small and large regarding the physical locations and descriptions given by Joe (Mc-Moneagle). Reading the Market square data for example, was like being transported to the actual site. These are the little gems of information Remote Viewing can surprise us with from time to time. Quite remarkable indeed." ​​​"The depiction of [French King] Charles VII appears to be spot on." "Naturally, there was a regret that we have no reliable contemporary portrait, but I wrote it off as an unfortunate fact. Then the surprise comes -- we have Joe with two "pictures" that history does not have, the sketch of Joan at the pillar (not stake) and finally that beautiful drawing of her face." "Have read the Joan of Arc book and loved it, Amazing. As I was reading through the Execution Square chapter I felt I was in the square, as the description really takes the reader straight to the place. Never really would have thought someone may have given Joan something to take the edge off such a cruel demise. Really thought provoking... Just about to start Titanic, then happy to purchase Amelia book. Thanks for the great read, and again will be soon to order...keep finding the great mysteries." "After I read the Joan of Arc material, I wanted to read more about Medieval history."